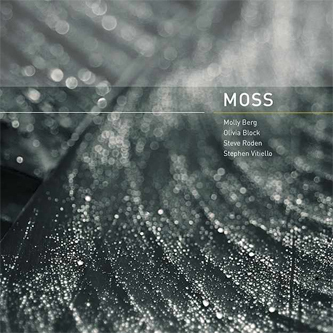 "Moss, is a live recording from a unique collaboration by sound artists/musicians Molly Berg, Olivia Block, Steve Roden and Stephen Vitiello. This was a midnight concert at the beautiful Trinity Cathedral in San Jose, CA which was part of the 01SJ Biennial. Olivia and Steve had performed solo sets on the previous nights. The final night was meant to be a duo with Molly and Stephen but the opportunity to play with musicians/friends who we admire so much called out for an invitation to play together. As the set was entirely improvised, the billing really changed in our minds from being a duo with guests to becoming a quartet. The church itself was certainly inspiring, it’s dark wood and clean dry acoustics. There was a very small but dedicated audience. No one slept and the church crew were able to, amazingly, quiet the rowdy revelers on the street for the duration of their set. Anyone familiar with any of the four musicians involved in this recording will know the level of craftsmanship and attention to sonic tactility that can be found within. They each exercise such incredible restraint, a feat difficult to pull off in an impromptu improvised session where musicians are often found competing for space, and allow for a sense of place to work its way through the quiet recording. “Moss” breathes like a living being lying down to sleep — a delicate wave of hushed field recordings, tape tracks and subtle electronics provides a bed for which Molly Berg’s clarinet and voice (joined at times by Steve Roden) ebb and sway, allowed center- stage, in movements across the piece’s 24+ minutes. Steve Roden and Stephen Vitiello provide guitar (lap steel and electric, respectively) while Olivia Block manipulates the tapes, field recordings and electronics. Moss is a perfect example of how four like-minded friends and musicians can come together at a moment’s notice and create, unrehearsed, a captivating and beautiful sonic landscape. The connection between them as artists is completely evident while at the same time disappearing into the background to allow the piece move like a singular body.